Full-body life like male manikin, Specially designed for professional trauma nursing care . High Quality manikin in provides wide range of exercise. 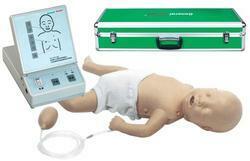 Owing to our expertise, we are offering to our valuable clients an excellent quality Manikins CPR-D. The offered product is manufactured using best grade material and latest technology in different sizes for our clients. It is tested on the standard parameter in order to deliver error free products at clients' end. Item Code: Code-GDH100S Full-body lifelike manikin.Specifically designed for professional nursing training. High quality manikin provides wide range of exercises possible including both first aid and emergency situations. Life-size reproduction of a neonatal head and lungs designed for practicing neonatal intubation procedures. Practice endotracheal tube insertion and securing. Anatomically accurate landmarks. Simulated lungs. Mounted on base. Airway lubricant included.